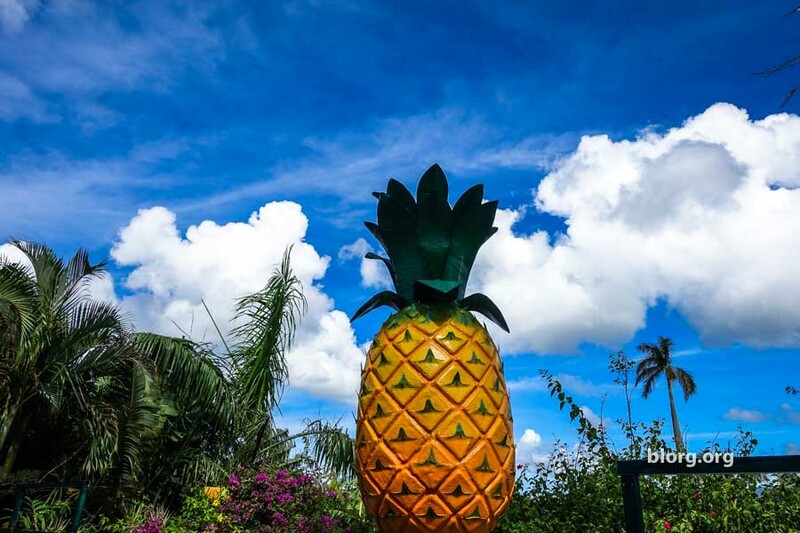 At Nago Pineapple Park, the gift shop is much bigger than the actual park. I don’t like pineapples so from the start I wasn’t too interested in anything at the park. You go in, get a ticket, then line up for the electric cart to start the process. Once in a cart, they’ll take a picture of you (1st one) in the carts as a souvenir in case you’d like to purchase it later. The electric carts are programmed and run their course. You can’t change the course of the cart once started (at least I couldn’t figure out how to change it). The cart takes you around the Pineapple Park where they grow and harvest pineapples at the facility. You’ll learn a few quick facts here and there about pineapples. Towards the end of the cart ride (total time probably 5 minutes), another picture is taken of you in case you want another souvenir photo. After 5 minutes of riding on the cart, you are dropped off at the entrance of the walking section. From there you’ll be walking above parts of where the cart had just driven you around for closer inspection. This is where they really grow the pineapples so you’ll run into a lot of insects. We ran into a very large spider and decided to use a different path. That’s what people should use instead of “Do Not Enter” sign, they should put giant spiders cause most people will stay the heck away. Once you’re done walking around, you then proceed into the very large gift shop. There are several gift shops on the way to the exit. Each gift shop is bigger than the last one. So if you notice the gift shops are getting bigger, you’re going in the right direction. In the gift shop you’ll find a lot of unusual pineapple related products such as curry, wine, tea and apparel. If you’re looking for things to do in Okinawa, this is definitely a thing.